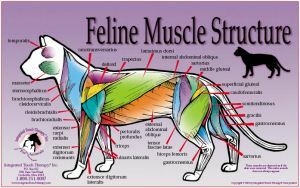 We're proud to announce our professionally produced animal-massage videos, DVD, companion workbooks, and laminated anatomy charts. 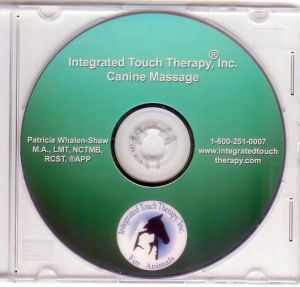 The canine video is over forty minutes long and demonstrates over 20 massage techniques, combining them at the end in a full-body massage demonstration showing the application of massage with respect for the dog. 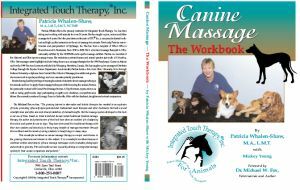 Over 96 pages, Canine Massage, the Workbook demonstrates a wealth of massage techniques in an organized text, with detailed drawings and photographs. 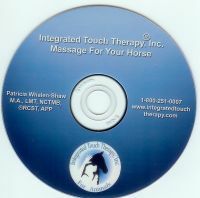 The equine video is over one hour in length, with precise instruction covering over 25 massage techniques; it shows each technique in detail and then combines them at the end for a massage demonstration. 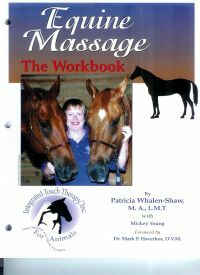 Equine Massage, the Workbook is 112 pages long, including step-by-step explanations of each technique, with many highly detailed photographs. Feline Massage, the Workbook is 115 pages, filled with photographs, graphs, and text. We cover over 25 massage techniques that can be used for feline massage. The anatomy charts are 11x17, beautifully laminated in vivid colors, providing concise visual reference to the musculature and skeletal systems.